The Qur’an: A Chronological Modern English Interpretation. Jason Criss Howk. Louisville, KY: Old Stone Press, 2017. My well-used translation of the Qur’an, purchased along with a roadmap of Iraq in 2003, has a new companion on my bookshelf. 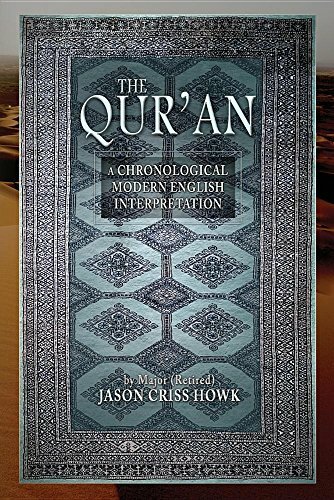 An impressive tome in intention and heft, Jason Criss Howk’s The Qur’an: A Chronological Modern English Interpretation delivers an approachable and highly readable version of this classic text. It is clear from the first sentence of the Acknowledgments that Howk has a deep and abiding respect for Islam. Having spent the better part of two decades immersed in Middle Eastern culture and language, and with extensive experience in numerous predominantly Muslim countries as a South Asia Foreign Area Officer, policy advisor, and scholar, Howk brings this experience and perspective to the Herculean task of reinterpreting the Qur’an. His personal statement on the back cover makes it clear his intentions are to educate and inspire acceptance of Islam through deeper understanding. Like many religious texts, reading the Qur’an is a daunting task, but Howk has succeeded in making it accessible to a modern, English-speaking audience and has created an entry point to the central tenets of Islam for all. The subtitle, A Chronological Modern English Interpretation, suggests two important aspects of this edition of the Qur’an. First, its use of modern English phrasing and vocabulary makes it navigable for a broad readership who might otherwise shy away from an unfamiliar religious text. Much in the way Shakespearean English (as Howk himself notes) can dissuade even the most determined student of literature, previous translations of the Qur’an, often done by native Arabic speakers, produced texts rife with archaic words, parenthetical alternative text, and phrasing confusing to an English speaker. Howk’s decision to use a modern style and vocabulary, albeit with special care to retain the original ideas and lessons of the Qur’an’s teachings, makes his work significantly more digestible for Western readers. The choice to place the Qur’an’s passages in chronological order is also interesting and proves, once again, the manner in which Howk so thoughtfully approached this project. To begin to understand the Muslim religion, it is essential to respect the central placement of the Qur’an and the importance of the text to its followers. One must subscribe to the basic belief that the passages were revealed to Mohammed by Allah (translated throughout the text as “God”), and the Qur’an captures what was originally an oral history. Passages in Howk’s interpretation are arranged chronologically as they were revealed to Mohammed over the course of 23 years. Just as there are contradictions between Old Testament teachings in the Bible and passages written later, some messages in the Qur’an can seem confusing without supplemental explanation from a religious scholar or imam. The chronological presentation helps the unfamiliar reader overcome these inconsistencies and see how the message of Islam evolved. This ordering of the stories told through chapters in the Qur’an aids in understanding of the tenets of Islam. Howk’s diligent approach to translation is rooted in his respect for Arabic as “a poetic language that does not easily translate directly into English.” He began with reading the text in its original Arabic. Using his knowledge of the language and various translation tools to glean each passage’s intent, he then compared at least five previous English translations by both Sunni and Shi’a Islamic scholars to clarify the meaning of each verse. The resultant updated English lexicon and fresh organization makes this interpretation a useful complementary source for the study of Islam as well as for informed discussion across religious divides. The volume’s large-print formatting makes it immediately feel more navigable and digestible than the well-read translation that has accompanied me on many trips to the Middle East. Howk’s inclusion of useful charts, maps, a well-edited bibliography, and a thoughtfully collated index support a supplemental analysis that provides context and background information for those of varying levels of familiarity with Islam. The table of contents includes cross-references to the traditional ordering of the 114 suras, or chapters, making it easy to compare translations. For each (such person) there are (angels) in succession, before and behind him: they guard him by command of Allah. Verily never will Allah change the condition of a people until they change it themselves (with their own souls). But when (once) Allah wills a people’s punishment, there can be no turning it back, nor will they find, besides Him, any to protect. Each man has angels around him. They guard you by the command of God. God does not change a man’s fate until man changes his heart. Know that once God directs His punishment, there is no repelling it, and there is no one that can protect you besides Him. While every translated text has inevitable limitations, this single comparison convinced me of the utility of Howk’s interpretation and the indispensable resource he has contributed to the international community. Strategic thinkers naturally seek to understand the contemporary operating environment in a continual process of learning, analyzing, and synthesizing information. For these strategists—as well as businesspersons, travelers, journalists, soldiers, scholars, and statesmen—Howk’s monumental undertaking delivers on his intention to shine a light on the central teachings of Islam to inform meaningful dialogue. If you are interested in understanding the world of Islam, there is no longer an excuse for not starting at the source and reading its central religious text. If you are interested in understanding the world of Islam, there is no longer an excuse for not starting at the source and reading its central religious text. The Qur’an: A Chronological Modern English Interpretation is an essential reference that has earned its place on the bookshelf next to other religious texts. This volume accomplishes precisely what its author intended by providing those with sufficient intellectual curiosity a means of seeking deeper understanding of Islam and forming their own opinion of the Qur’an. This mission is both inspirational and aspirational. The gap we must close in modern society to achieve lasting international stability is vast. It is an intellectual divide that is multi-dimensional, layered, nuanced, complex, and sometimes maddening. Howk’s refreshed interpretation of the Qur’an is a noteworthy step in bridging this divide through respect and acceptance. Kellie J. McCoy is a retired U.S. Army officer with extensive operational experience in the Middle East. She is a graduate of the U.S. Military Academy at West Point and holds master’s degrees in military art and science and environmental engineering. The conclusions and opinions expressed in this article are hers alone and do not reflect the official position of the U.S. Army, the Department of Defense, or the U.S. Government.